Organizing cabinets in a home needs meticulous planning. Even a spacious home requires adequate storage for storing linen and other supplies. A well-planned linen cabinet can go a long way in ensuring that all your home supplies are within easy reach, stored safely and complement your housekeeping efforts. A survey by The International Housewares Association reveals that Americans spend around $9 billion every year on space organizing and products for closet creation. Assessing the storage area to plan the depth and width of the linen cabinet is most important for designing. The cabinets or closets should suit the design and decor of the bathroom or the utility area where you plan to install a linen cabinet. For easy access, linen cabinets can be installed within the reach of the shower. The cabinets should be designed in such a way that folded towels and sheets can be arranged in good order. Space available inside the linen cabinet can be designed to store all your linen safely. According to the decor, the right-sized cabinet may be designed in wood or other materials. 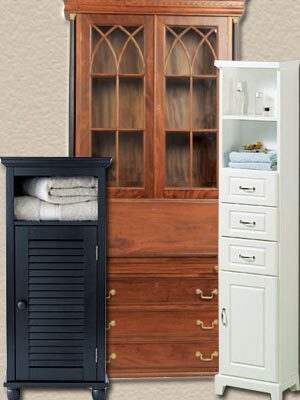 The size of the linen cabinet should be large enough to hold towels, sheets and other bathroom supplies. Baskets that hold the supplies can be installed inside the cabinet for easy and better access. This will help to minimize clutter. Shelving inside the cabinet not only helps to reduce chaos but aids better management of existing space. Warm tones lend a classy look to your linen cabinets. Darker shades can be chosen for the cabinets while installing them in a bathroom with walls of lighter shade. This provides a pleasant contrast. Alternatively you can blend the linen cabinets with the walls to give a recessed look. If the bathroom is small in area, installing linen towers that are as tall as pantries is yet another choice. These towers can contain center drawers for storing towels and other bathroom supplies. If bathroom has adequate open space, wall mounted cabinets are the best option to store linen. Instead of just fixing a towel rod to the wall, you can think of a wall-mounted bathroom cabinet incorporating a design that has provision for a towel rod. This linen cabinet idea provides for additional storage for bathroom supplies like shampoos, deodorants, beauty products and more. There are walk-in linen cabinets that incorporate multiple hanging sections, adjustable shelving, maxi-bins, baskets, a hidden portable laundry hamper and shoe racks. There can be separate sections for storing ties, belts and scarves. While designing and choosing drawers within the linen cabinet, one can experiment with different styles and sizes. Choosing the frame width, frame height, drawers and accessories is the first step. You can plan the style of your walk-in linen cabinet to suit the bedroom furniture. One has to use ingenuity to mix and match various cabinet accessories such as drawer banks and linen cabinets. You can go in for contemporary or traditional styles. You can try mirrored cabinet doors. Staggered cabinets, frame-less inset mirror, carved doors, functional doors - the options are many. You can create personalized designs and make use of do-it-yourself kits available at home improvement stores. This is an ideal workaround for those working on tight budgets. Store only things which you need. Discard those unwanted clothes and arrange hangers to the rod accordingly. Hide all those warm clothes when they are not necessary. There are some space-savers like under-bed boxes and vacuum-sealed storage bags to store unwanted clothes which can be stored in the garage or attic. Ski boots, scuba wet suit and holiday clothing that you need only occasionally can be stored this way and not in the linen cabinets. Now that the excess clothing is removed, the linen closet can easily be designed for the linen that is used regularly. You can evaluate your linen needs and take the help of a good design house to create a utilitarian linen closet to suit your requirements. Take into account growing family needs. Though hanging clothes from a rod that is provided inside the closet is the tradition, folded clothes can be stored in a closet which has more shelves and drawers. Ironed clothes stay wrinkle-free only if they are kept in a closet or drawer that has enough space. Choosing a linen cabinet that has shelves and shelf dividers will serve you better to keep bulky rugs, bed linen, table linen and bath linen. Work out some order while arranging your linen closet. It can save you much bother later and can be a godsend when you are looking for something in a hurry. Not many people prefer to have a laundry hamper because dirty clothes kept inside will spread odor that will also spoil your clean clothes. Hallway linen closets are best for bed sheets and pillow cases. Travel bags and suit cases can be stored in the attic or basement instead of a linen closet. Ensure adequate lighting for your linen cabinet so as to allow you to arrange, store and retrieve linen as easily as possible. First Published Date: Jul 10 2004 Last modified Date: April 25 2019 This page may have been updated recently as new information is available or the content may have been edited for better readability.